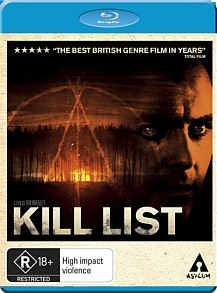 Kill List Review. Kill List is about as far from a popcorn movie as you can get. The narrative is peppered with scenes of stark brutality and violence, which will have an effect on you. On the face of it, Jay looks like a normal suburban Dad, with typical problems. He hasn’t worked for eight months, owing to a ‘back injury.’ Money is running out, which is a constant source of tension between himself and wife Shel. On the face of it, Jay looks like someone you can empathise with, maybe pity a little. But you can’t take anything at face value in ‘Kill List.’ The setting up that occurs for the first half our or so of the movie is meant to soften you up, and it only makes Jay’s complete transformation all the more shocking. The script reads like a fairly standard thriller: A hitman named Jay (Neil Maskell), suffering from psychological problems after his last contract, is invited back into the fold by long-time partner Gal (Michael Smiley.) After meeting a mysterious old man in a hotel, the two are given envelopes containing the names and photographs of the people to be eliminated. Jay suspects something is wrong when his first victim, a Priest, thanks him and smiles before submitting to his fate. Things get even stranger as they go on to the next target. Jay starts to fall apart, piece by piece, barely held in check by the comparatively sane Gal. This is a movie that forces a response out of you, on both an intuitive and an intelligent level. Intuitive, because it cultivates a sense that something is horribly wrong with Jay’s world, right from the outset. It’s a disturbing kind of horror that you can’t put your finger on. Intelligent, because it forces you to pay attention to detail and work out how all the events are connected. After the movie is finished you’ll look back on it and analyse it; was that car in the background significant? How did that strange girl fit in? Nothing is completely explained, making you piece the events together for yourself. The film doesn’t start as a traditional horror, but it does morph into one towards the end. The bright, suburban setting slowly gives way to dark shipping containers, and finally dripping tunnels beneath a pitch-black forest. The change of pace is accompanied by a steady dimming of the light, until there is almost none left- it’s a clever and powerful technique on the part of the film-makers. The soundtrack is full of plunging violin strings, dramatic percussion and high-pitched noises that sound like animals yelping. It all adds up to a very creepy audio package. On the video side of things, the Blu-Ray format is a great showcase for director Ben Wheatley’s adept use of light and dark, as well as for some subtle yet unnerving make-up effects. Making of Kill List: This feature comes without narration, and shows you how different lighting effects and camera angles were set up during the creation of the film. Interviews: More enlightening than the previous feature, these interviews have director Ben Wheatley and some of the key actors talking about various aspects of the project. Kill List is about as far from a popcorn movie as you can get. The narrative is peppered with scenes of stark brutality and violence, which will have an effect on you. You won’t be spoon-fed a story here; Kill List forces you to do most of the intellectual heavy lifting for yourself, which is no bad thing.